Elder Larry McCrimager coordinates the Arts and Music Ministries, which includes the Praise Dance Ministries, the Praise and Worship Team, Agape Ensemble and the Voices of Koinonia. He also instructs the New Members Classes. 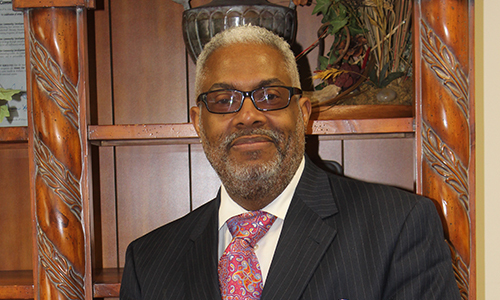 Elder McCrimager has been a member of Mount Zion Fellowship for over 25 years, including serving as a Deacon. In April 1991, under the leadership of Dr. Williams, he was ordained and licensed as an Elder. “Elder Larry”, as he is known at Mount Zion, has a great love for music and singing. He is a member of the Voices of Koinonia, the Praise Team, and currently sings with the Cleveland Men of Song. His many singing aggregations have afforded him the opportunity to record on several albums through the years. Elder Larry, the youngest of four siblings, is a 40-year active member of Alpha Phi Alpha Fraternity Inc. He is also a member of the 100 Black Men of Greater Cleveland.